Make yourself at home in one of the 8 air-conditioned rooms featuring flat-screen televisions. Complimentary wireless Internet access keeps you connected, and cable programming is available for your entertainment. Bathrooms have showers and complimentary toiletries. Conveniences include desks and coffee/tea makers, and housekeeping is provided daily. Featured amenities include a 24-hour business center, complimentary newspapers in the lobby, and dry cleaning/laundry services. A shuttle from the airport to the hotel is provided for a surcharge (available 24 hours), and free valet parking is available onsite. Enjoy recreational amenities such as an indoor pool and a fitness center. This aparthotel also features complimentary wireless Internet access, wedding services, and a banquet hall. Grab a bite to eat at one of the resort's 2 restaurants, or stay in and take advantage of the 24-hour room service. Snacks are also available at the coffee shop/café. Unwind at the end of the day with a drink at the bar/lounge or the poolside bar. Buffet breakfasts are available daily from 7 AM to 10 AM for a fee. Make yourself at home in one of the 78 air-conditioned rooms featuring kitchens with refrigerators and stovetops. Your pillowtop bed comes with down comforters and Egyptian cotton sheets. 40-inch LED televisions with cable programming provide entertainment, while complimentary wireless Internet access keeps you connected. Conveniences include phones, as well as safes and desks. 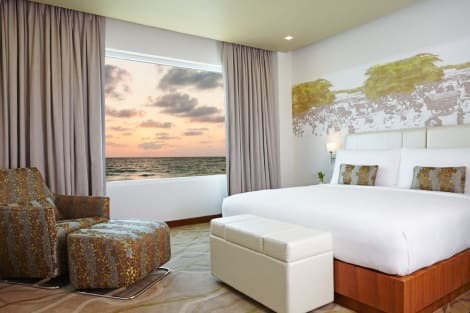 Located in Colombo, Jetwing Colombo Seven is within a 15-minute drive of Galle Face Green and Galle Face Beach. 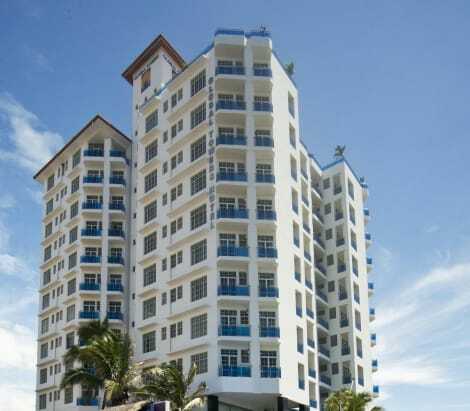 This 5-star aparthotel is 3.1 mi (5 km) from Pettah Market and 6.4 mi (10.3 km) from Mount Lavinia Beach. 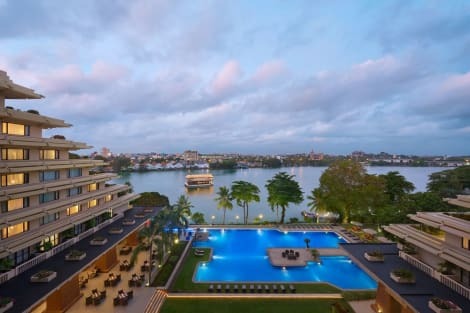 Awarded the title of Sri Lanka’s Leading Hotel and Sri Lanka’s Leading Business Hotel at the World Travel Awards, this Colombo hotel is centrally located in Colombo’s business district. With a range of accommodation, from guest rooms and executive rooms to suites, this hotel in Colombo offers stunning views over the Indian Ocean.With ten speciality restaurants and bars, from Il Ponte, Sri Lanka’s only Italian trattoria to Curry Leaf, serving its famed Sri Lankan cuisine, the Hilton Colombo hotel is a city favourite for both visitors and locals to dine at.Forty five minutes away from the Bandaranaike International Airport, this Colombo hotel offers business travellers both comfort and convenience. Directly connected to Colombo World Trade Centre, Hilton Colombo offers 25 onsite venues for business and social functions, including the city’s only pillar-less ballroom. Make yourself at home in one of the 346 air-conditioned rooms featuring minibars and LCD televisions. Your pillowtop bed comes with down comforters and premium bedding. Complimentary wireless Internet access keeps you connected, and satellite programming is available for your entertainment. Bathrooms have rainfall showerheads and complimentary toiletries. Make yourself at home in one of the 229 individually decorated guestrooms, featuring minibars and flat-screen televisions. Complimentary wired and wireless Internet access keeps you connected, and satellite programming provides entertainment. Private bathrooms with shower/tub combinations feature designer toiletries and hair dryers. Conveniences include phones, as well as safes and desks. Colombo is Sri Lanka's largest city, with a modern, metropolitan ambience and clear European influences. As a port town and former British colony, it's a popular gateway to the rest of the country. 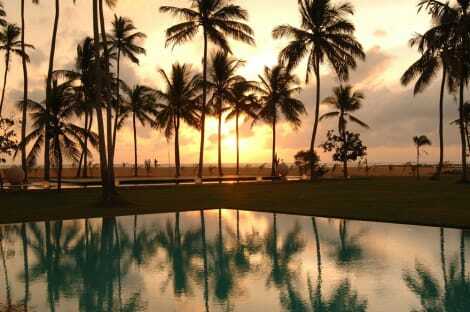 Colombo's own charms are out in force, from its scenic waterside developments, to its tropical climate all year round. 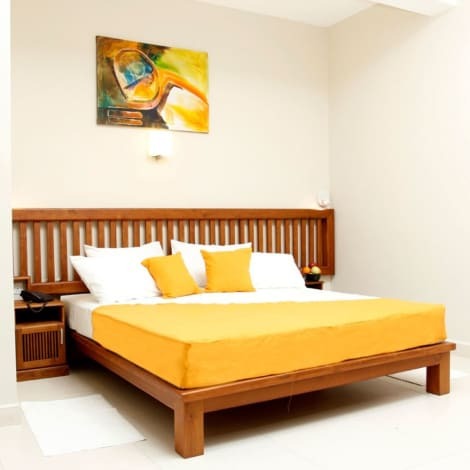 The city's rapid modernisation has seen the facilities and quality of all Colombo hotels increase. Your options – almost all with waterside views – include a Hilton and a Grand Oriental. The city's public transport network is extensive, with bus stops and rail stations criss-crossing the map. On the Coastal Line, you can get to Mount Lavinia for the ‘Golden Mile' of sandy beaches, as well as Sri Lanka's National Zoological Gardens. Colombo is ‘fenced off' on the north side by the Kelani River. With the entire west border of the city running down the coast and Beira Lake in the middle, it has more of an island atmosphere. There are regular ferry services to India via Mumbai and Chennai. A visit to the sprawling harbour is not to be missed. The Port of Colombo is the busiest in both Sri Lanka and the whole of South Asia. The harbour itself is very industrial, yet there are also many tourist attractions around such as the Colombo Lighthouse. The Colombo Fort Clock Tower is a former lighthouse and one of the Colombo Fort area's main landmarks. The centre of the city is known as the Slave Island area or Colombo 02. The name dates back to colonial times. It's a very multicultural side of Colombo, with plenty of shopping centres and the Hindu Subramaniya Temple. The temple is also close to the Masjidul Akbar mosque, representing the area's substantial Muslim population. Many trademark Sri Lankan dishes use coconut and a blend of strongly scented spices. Alongside regional styles, curries in particular are staple dishes throughout the country. It's unlikely you'll see a Sri Lankan restaurant without ‘parippu' – dhal, a lentil curry – on the menu, which is definitely worth a try. Colombo is packed with restaurants, so if you're in the mood for something a bit different, it's not hard to find. Pick up Chinese or Japanese food, or discover the influence of the city's links to Tamil Nadu with some South Indian cuisine.